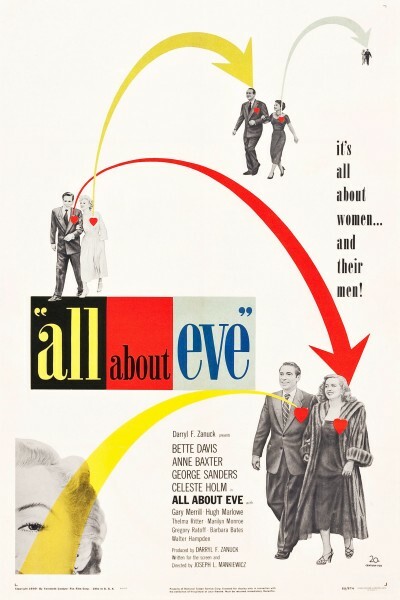 All About Eve won the Oscar for Best Motion Picture of 1950, and was nominated in a total of fourteen categories, a feat which remained unequalled until Titanic in 1997 and still has not been beaten. 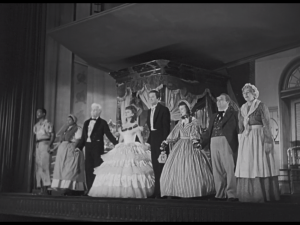 It won five other Oscars: George Sanders won Best Supporting Actor, Joseph L. Mankiewicz won for both Best Director and Best Screenplay, and it also got Best Costume Design – Black and White and Best Sound Recording. 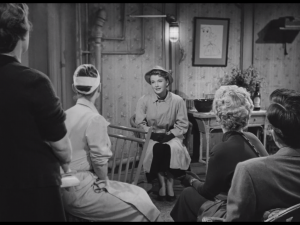 All four female leads were nominated (the only time this has ever happened), Anne Baxter and Bette Davis for Best Actress and Celeste Holm and Thelma Ritter for Best Supporting Actress, but none of them won. The other contenders for Best Motion Picture were Born Yesterday, Father of the Bride, King Solomon's Mines and Sunset Boulevard. This is another one of those films I had not heard of before starting this project. It's the story of an aging actress who is flattered by attention from a young fan, but then alarmed when the younger woman starts to infiltrate her professional and personal life. I liked it immensely, and it's going near the top of my list, ahead of Hamlet from two years ago and just behind The Best Years of Our Lives from two years before that. That's the downside. There are lots of upsides. 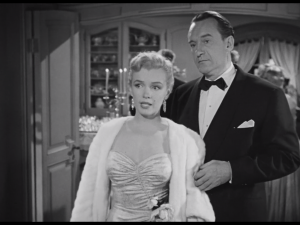 To start with, this was one of Marilyn Monroe's first screen roles; she has only a small part, as an actress who is rising through the ranks, but already the camera loves her. 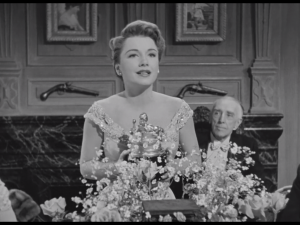 George Sanders' character, Addison DeWitt, actually says, “I can see your career rising in the East like the Sun”. 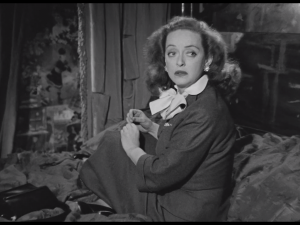 Although the film is dominated by the two leads, Bette Davis as Margo and Ann Baxter as Eve, there's a good sense of ensemble from the cast and some nice camerawork pulling it together. 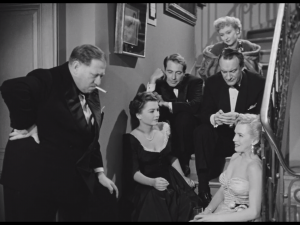 I love the stairs set with Marilyn, above, and these two shots looking in different directions from the same scene in Margo's dressing room, with first Gary Merrill as Margo's boyfriend Bill, Celeste Holm as her friend Karen, Thelma Ritter as her maid Birdie (the two nominees for Best Supporting Actress) and Bette Davis as Margo all looking at Ann Baxter, out of shot as Eve; and the next shot shows us Thelma Ritter / Birdie and Bette Davis / Margo from behind, Ann Baxter / Eve facing them, and then Celeste Holm / Karen and Gary Merrill / Bill from vehind again. The message is that there is often more than one perspective from which to understand a story. 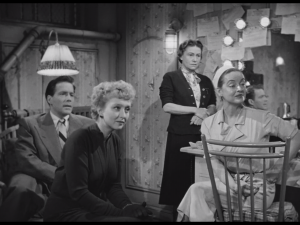 We saw Celeste Holm just three years ago in Gentleman's Agreement, for which she did win an Oscar. Here she is again. 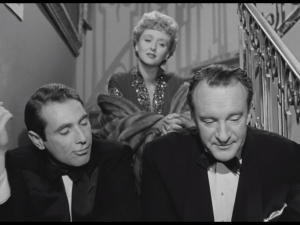 So is George Sanders (on right of second pic below), who we met both in Rebecca ten years ago and in a more recent Retro Hugo diversion to Dorian Gray. 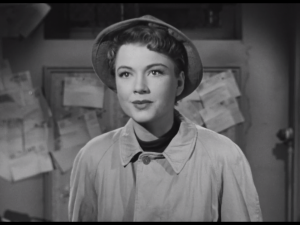 Anne Baxter really glows as Eve, muscling in on Margo's life and then at the end discovering that she has a young female stalker of her own. 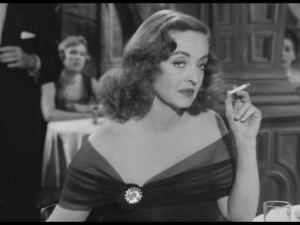 But the picture is totally owned - in a perfectly collegial way - by Bette Davis as the aging Margo, who gets most of the good scenes and most of the good lines. Margo: Lloyd, honey, be a playwright with guts. Write me one about a nice normal woman who just shoots her husband. Margo: Bill's thirty-two. He looks thirty-two. He looked it five years ago, he'll look it twenty years from now. I hate men. 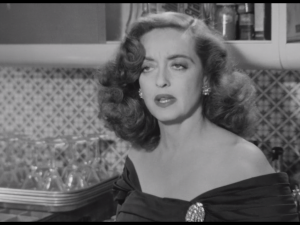 Margo: Nice speech, Eve. But I wouldn't worry too much about your heart. You can always put that award where your heart ought to be. Lloyd Richards: What makes you think either Miller or Sherwood would stand for the nonsense I take from you? You'd better stick to Beaumont and Fletcher! They've been dead for three hundred years! Margo: ALL playwrights should be dead for three hundred years! 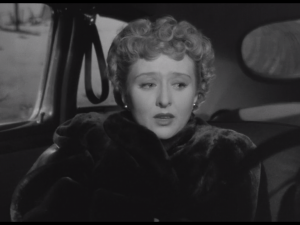 Margo: Fasten your seatbelts, it's going to be a bumpy night! It was an amusing coincidence that several of the early scenes are about catching a flight to San Francisco, and I was actually on a flight to San Francisco as I watched. Next in the sequence of Oscar winners is an old favourite of mine, An American In Paris - but I actually watched it just over a year ago, and wrote it up out of sequence, so I will be going straight on to The Greatest Show on Earth, of which I know nothing. 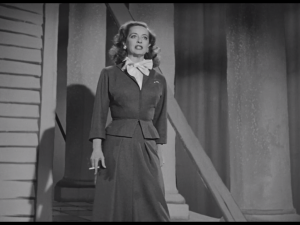 Knowing that An American In Paris is in colour, I am wondering if All About Eve will be the last film I watch for these purposes in black and white? There was a crowd at the stage door. They were the usual autograph fans, all with little books open and fountain pens dripping ink. Some appeared to be intelligent theatergoers; they carried programs for Margola to sign and had obviously seen the play that evening. I could hear their enthusiastic comments through the tiny opening where I had lowered the car window to let my cigarette smoke escape. A few were boys in uniform with dreams of dating Margola—dreams that would not come true. There was only one person standing there I could not catalogue. She stood nearest the car, and I could see her face clearly in the light of the streetlamp. It's a nice character study, only a dozen or so pages long, which sets up the emotional dynamic just the same but has a very different ending - the narrator is Margo/Margola's friend Karen, and Eve runs off with Lloyd, her playwright husband (as she threatens to but doesn't in the film). It doesn't add much to my appreciation of the film but I'm glad to have read it for completeness. Without wanting to spoil you, no, you have at least one more black and white film as far as I am aware. As to other films, I'm with you in not having seen a lot of them. 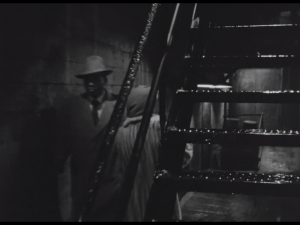 No Way Out, which I haven't seen, features Sidney Poitier's debut and I suspect is cracking. On the more minor awards, The Flame and the Arrow, which I love despite being a lot of nonsense (it's a lot of nonsense with swordfighting and archery and Burt Lancaster and Nick Cravatte), was nominated for the Best Score Oscar, which I didn't know. The Third Man won best black and white cinematography. I'm presuming you've watched it but if not, I definitely recommend it.